I mount all my aphids in Canada balsam, which is made from the resin of the balsam fir tree. Following is a description of the procedures, tools, and fluids I use. Before getting to slide making, I should mention how I preserve my specimens. I learned early on that aphids preserved in ethanol of 70-95% concentration quickly (i.e. within a month) become brittle and difficult to mount without serious dismemberment problems. Consequently, I adopted a collecting solution that was suggested by my acarology professor, Gerald Krantz. He presented a recipe in his book (A Manual of Acarology, 1978) and called it Oudeman’s fluid: Glycerine — 5 parts, 70% ethanol — 87 parts, glacial acetic acid — 8 parts. This solution not only keeps fresh material pliable for years, it also can soak and render flexible previously dried or damaged specimens. Best mounting results with aphids preserved in this fluid, following my methods below, are achieved when the specimens are soaked for a month or more. Less than a month and NaOH clearing is less effective for some reason. 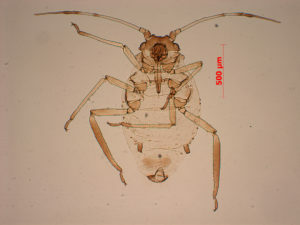 Puncture the abdomen of each aphid and transfer them to a vial of 9.1% NaOH (plumber’s lye) or KOH prepared using distilled water (tap water will work, but the minerals precipitate and cause the solution to become ineffective sooner; store NaOH solution in the fridge). Heat in a water bath using a soup warming hot plate (about 38°C) for about 20 minutes. Pour these into a dish and pump out most of the contents of each aphid using a small spatula. Heat aphids in fresh NaOH (or KOH) for another 30-40 minutes. In a dish, finish pumping colored body contents, then transfer clear aphids to 50% ethanol, let stand without heat, covered, for at least 30 minutes. This treatment can often be omitted, leaving only the subsequent 70% and 95% ethanol treatments, however, with some aphids, whiteflies, and other especially delicate arthropods, the appendages shrivel without the 50% ethanol rinse. Transfer to 70% ethanol for 30 minutes at least. Transfer to 95% ethanol for at least 1 hour, up to several hours. Transfer to unheated clove oil for at least 2 hours. To do this, I use a microspatula to scoop one or more insects out of the ethanol, then I lightly touch an absorbent napkin to remove most of the excess ethanol from the specimens. Aphthargelia rumbleboredomia ovipara, showing the outcome of good slide mounting process. Mount in Canada balsam (thinned as needed with orange oil), labeled appropriately, etc. Press the cover slip enough so the legs lie flat, but the head and appendages are not deformed. Balsam can be added around cover slip if necessary to fill in empty spaces. Slides are dried at room temperature (or on the shelf above the wood stove) for several weeks before being filed in 100-slide boxes. I prepare 10-15 slides per day, representing 4-8 separate samples. I mount up to 8 or10 specimens per slide, but usually 4 or fewer. 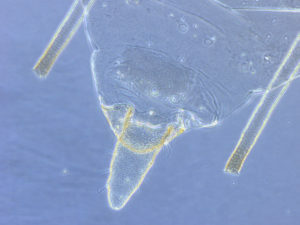 Certain taxa of aphids have biochemistry that interferes with some steps in the process (e.g. precipitation of crystals), but just forge ahead with it best as you can, and in the end the results are usually OK. Clove oil can cure a lot of problems in the last step. 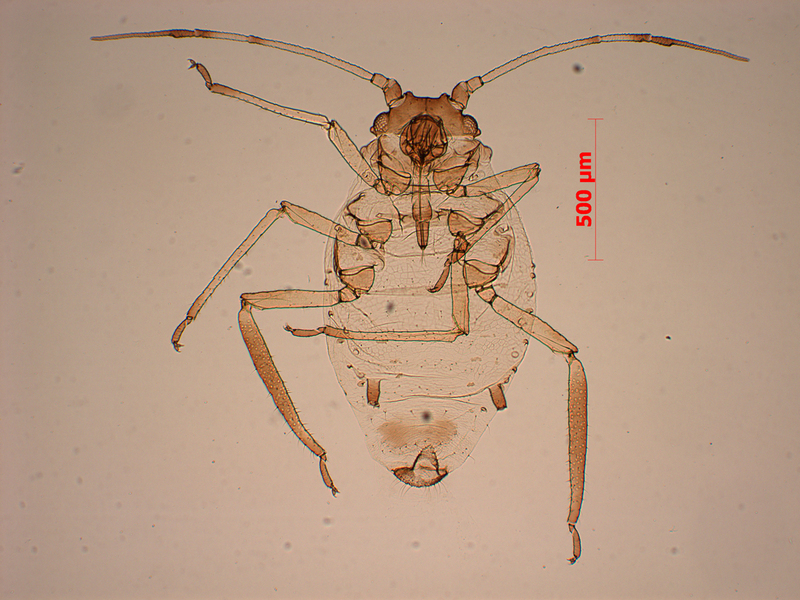 Macrosiphum schimmelum posterior of the abdomen to show good clearing and mounting outcome. Lye (NaOH) can be found in old fashioned hardware stores, not so much in the mega home improvement stores. Be careful with it; it’s no joke. Due to some unreliable lab technician work (by me), I’ve had the opportunity to try 9.1% NaOH, 10% NaOH, and something around 14% NaOH. I have ended up preferring the 9.1% solution. 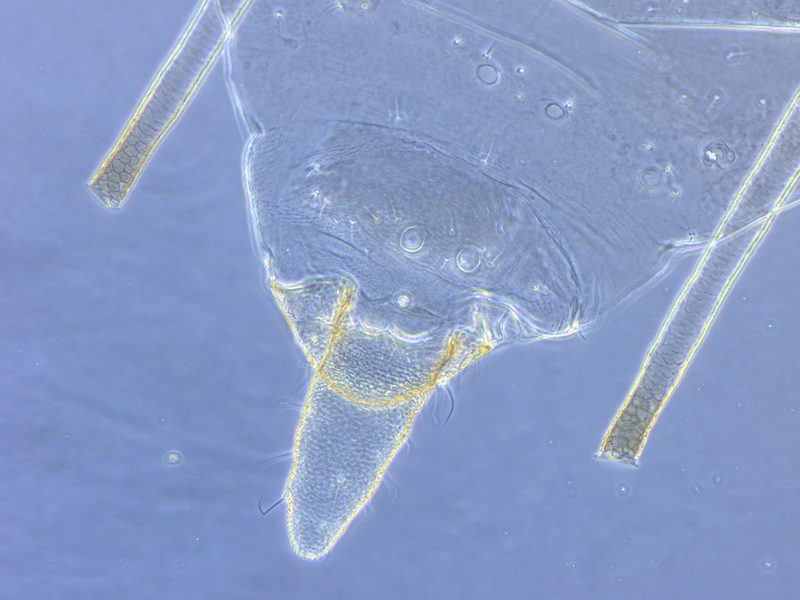 The ~14% solution was completely un-usable because the internal parts of the aphids were turned into a stiff gelatinous mass rather than dissolving. With 10%, this same sort of phenomenon sometimes occurred, depending on the aphid taxa being prepared. At 9.1% I don’t have such trouble; in some taxa the internal fluids tend to solidify in a different way, creating large rounded crystalline masses. These, fortunately, dissolve in clove oil at the last step. Clove oil and orange oil are available at health food stores, and of course online from a plethora of vendors. I use contact lens storage containers for soaking in clove oil. These could also be used for the ethanol stages. The same clove oil can be used for preparation of many specimens. I replace the clove oil in my contact lens holders after about 100 slides. I buy Canada balsam from Woodfinishing Enterprises in Wauwatosa, WI. It costs about 10% as much from him as it does from Fisher, VWR, and similar, and his works just as well. If he doesn’t answer when you call, leave a message (there is no online ordering). He’ll call back. In fact, he has even called back when I didn’t leave a message.